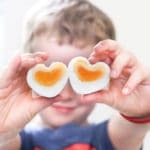 Making Heart Shaped Eggs transforms the humble boiled egg into something fun. I am not one to turn everything I make into a “fun food” but at certain times of the year, like Christmas and Easter, I do like to make a bit of an effort. In this case, I am looking towards Valentine’s Day. 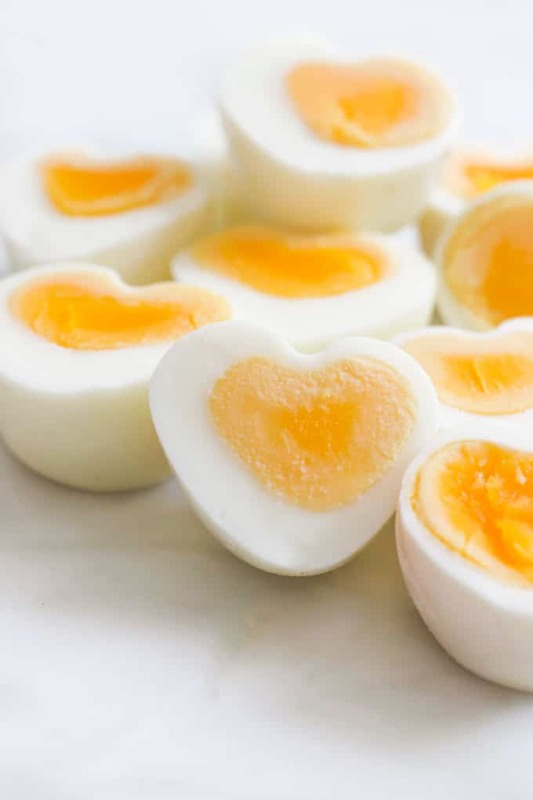 Heart shaped eggs fit the bill. The process is easy, the boys love it, and I am happy they are getting a protein packed healthy breakfast to set them up for the day! While there are a number of gadgets available to change your eggs into special shapes, the good thing about this process is that it does not need any special moulds. Place egg in the centre of the cardboard along the fold. 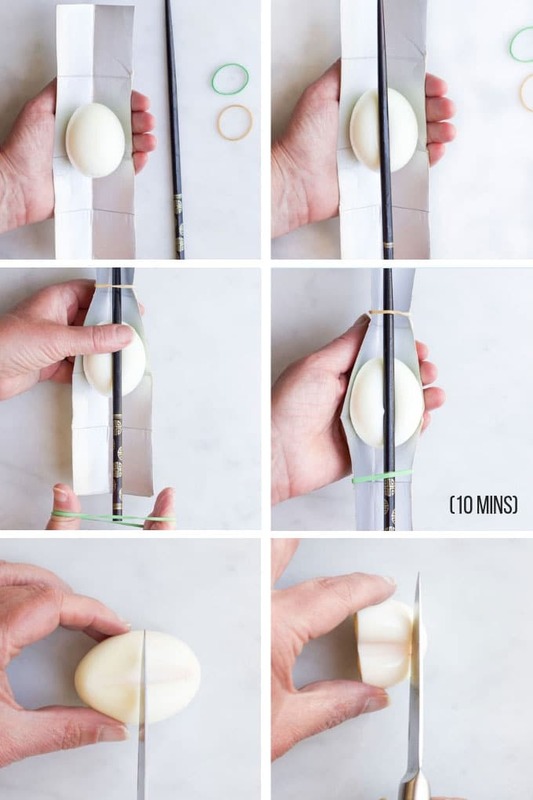 Place the chopstick along the top of the egg to form an indentation. Secure with rubber bands at each end of the cardboard cradle. Leave for a minimum of ten minutes in the fridge. If you need to serve them flat remove a tiny piece from top and bottom of the egg. Place on a piece of toast for a well-balanced breakfast. Pop into lunch boxes and surprise your kids. 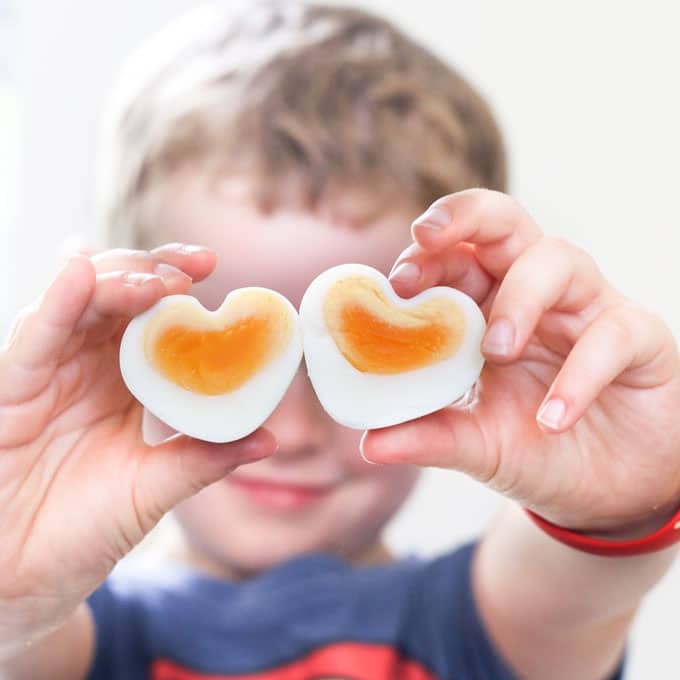 Make heart-shaped devilled eggs by removing the yolk, making the mixture and reforming. Scatter on a bed of leaves with cheese to make cheese and egg salad. Have you tried this recipe? I love hearing your feedback. Rate and leave a comment below or tag me on Instagram. Remove the shells while still warm and place the egg in the centre of the cardboard along the fold. Place the chopstick along the top of the egg to form an indentation and secure with rubber bands at each end of the cardboard cradle. I use an egg machine to do this but you can place the egg in a pan and cover with water, bring to the boil and then remove from the heat and allow the egg to sit off the heat for 10 mins.